I've written a few posts about Woodlawn's track practice on January 13, 1999. For instance, in this post, I addressed the question of whether track practice started at 3:30 P.M. Later, in this post, I noted how Adnan's defense team failed to contact his track teammate Will despite having every reason to believe that he could have had information that would have completely destroyed the State's case. But what if there were another person connected to the track team whom the defense erroneously failed to contact? The names of two of the three track coaches listed at the bottom should be familiar. Coach Sye was the head track coach in 1999; he's the one who recalls talking to Adnan during track practice on the rare warm January day in 1999. Coach Russell was an assistant track coach who was mentioned a few times in this post by Susan Simpson. Both Coach Sye and Coach Russell were subpoenaed. Coach Sye testified as a witness for the defense; Coach Russell was not called as a witness. I'm not sure whether Coach Russell simply lacked useful information or whether he was never properly subpoenaed, like Krista. Here's a memo from the defense files. That leaves the third coach: Mark Pryor, the first coach listed in the above memo. As far as I can tell, he might have been the coach for field events at Woodlawn in 1999 and/or an assistant coach who took over as head coach in 2003. The conspicuous box around Coach Pryor's name and the placement of his name before the other coaches makes it seem like he was viewed as pretty important and someone whom the defense was interested in contacting. And yet...there's no other mention of Coach Pryor in the defense files. No indication that he was ever contacted. He was certainly never subpoenaed and never testified as a witness at trial. Now, it's certainly possible that Coach Pryor would have had nothing meaningful to say if contacted. It's also possible that he might have said something that hurt Adnan's case. That said, given that Coach Sye seemed to recall seeing Adnan at practice on January 13th, there seems to be a decent chance that Coach Pryor would have had a similar recollection. But, based upon another failure by Adnan's trial attorney, we'll likely never know. Let's ask him ourselves? I find it so difficult to believe in this day and age that none of these people know about the continuing case or that people are interested in what they have to say. Coach Mark Pryor? Are you out there???? I think I asked this before, but just to confirm, is it true that there is no report from Drew Davis' early March investigation into Coach Sye in the defense files? He obviously provided detailed reports on LensCrafters, Sis, Stephanie, etc. during this time period so I'm wondering what happened to the Sye report. fourhens: Unfortunately, I doubt that he remembers that day 16 years later. Seamus: I wish I knew. Sye and Officer Mills were interviewed by Davis on 3/3. There are no notes from either interview in the file. I'm still trying to figure out Mills's connection to the case. Considering this is right around the time Adnan allegedly received the Asia letters, I find it worrisome that documents are missing from the defense file. Especially in light of the fact that Asia specifically said "no attorney" contacted her in her affidavit, opening up the possibility Drew Davis contacted her early in his investigation. If he contacted hundreds of people, is it really reasonable to assume he didn't contact Asia? Seamus: Asia says in her 2015 that nobody from the defense team contacted her. I don't know why she would lie about this. 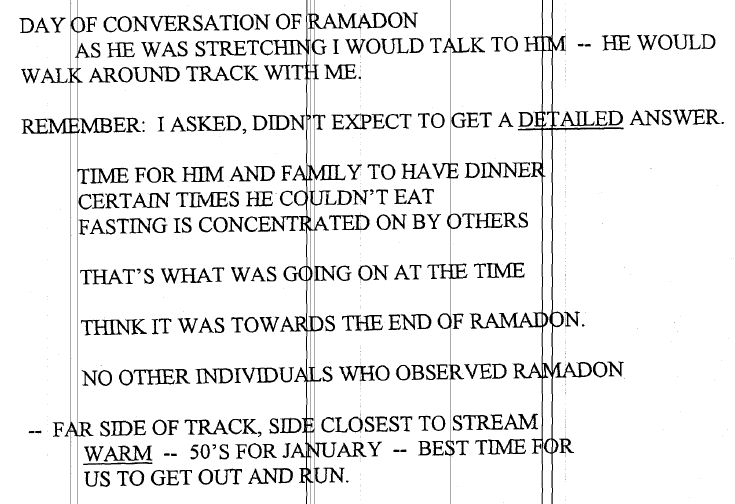 Also, the morning of March 3rd was the big meeting among Adnan, Flohr, Colbert, and Davis. This is when Davis was likely given his list of people to interview, and Adnan almost certainly hadn't received either of Asia's letters at this point. Can you post the notes on Officer Mills so we can help you to figure it out? I think it's worth pointing out that the original affidavit specified that "no attorney" contacted her, which still leaves open the possibility Drew Davis contacted her. Cupcake: There are no notes for the interview with Officer Mills. Seamus: Only if one thinks that Asia is lying/mistaken in 2015. Does no notes mean no contact? I remember you mentioning that some of Cristina's files were misplaced and you discovered files of some other cases in Adnan's files. Is there no more information/context about him/her? How many times are they mentioned? It's definitely not a typo for Owings Mills?! "...given that Coach Sye seemed to recall seeing Adnan at practice on January 13th..."
But Sye did not recall. He has no "recollection". Im not sure why you are stating this as fact?? Sye testified at trial that he could not recall if Adnan was in attendance on the 13th. He recalls a conversation with Adnan about Ramandan, but he cannot say under oath that this conversation took place on the 13th. All the weather reports and extrapolations posited by Ms. Simpson, will not change this fact: Coach Sye does not know if Adnan Syed was in attendance at track on January 13th, 1999. S, Cupcake, and fourhens: There’s just a reference to Davis interviewing Officer Mills, but no notes. I assume that the interview took place. Badger: I think I laid that all out in my post. Coach Sye recalls seeing Adnan at track practice on a day with weather that is only consistent with January 13th. Coach Sye, however, does not specifically recall the day being the 13th. That’s why I said that Coach Pryor could help Adnan (remembers seeing him on 1/13) or hurt him (remembers not seeing him on 1/13). Is this the report on Officer Mills? Seamus: Earlier in the report, it states that "PD Davis was instructed to speak to Detective Joe O'Shea from Baltimore County Police Homicide." So, I assume it's referring to him. Davis's billing summary lists the interview with "Wackenhut Off. Mills" on 3/3/1999. From what we've been able to gather, Mills isn't even a real cop; he probably worked for the company that provided food, etc. at the prison. Davis's trip to LensCrafters was on March 16th, according to the billing summary. The note we're referencing is undated, so it could have been typed on March 16th or at some later date. Do you know why coach Graham isn't listed?